This is the cheapest and probably the BEST upgrade you can make to the tone, response and sustain of your tremolo equipped guitar. The "Sustain Block" part of the classic fulcrum trem is the only thing that keeps a Strat style guitar from sounding lifeless and wimpy- let's face it- you carve out a big chunk of wood to install that trem. Most imported guitars come stock with a thin "Pot Metal" block that is carved away for reduced weight. To add insult to injury- most of these blocks have DEEP string access holes which means the string "Ball" end sits right up top- near the baseplate. The result?? The block is just a place to hang the springs. 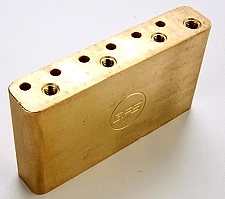 Our upgrade blocks are crafted from SOLID Steel or SOLID Brass. Steel gives you the great sustain and that piano-like response. Brass gives you great sustain and introduces a warmer, richer bottom end. How to choose?? If your guitar is lifeless and dull go for steel- if your guitar is thin and wimpy- go brass. We stock blocks for the three commonly available six-screw fulcrum tremolos. Asian- 10.5mm string and screw spacing with a center-mounted trem arm...."Made in Mexico- which is 10.5mm spacing with a trem arm set towards the back of the block..... and USA which is 11.3mm spacing and the trem arm towards the back of the block and angled.